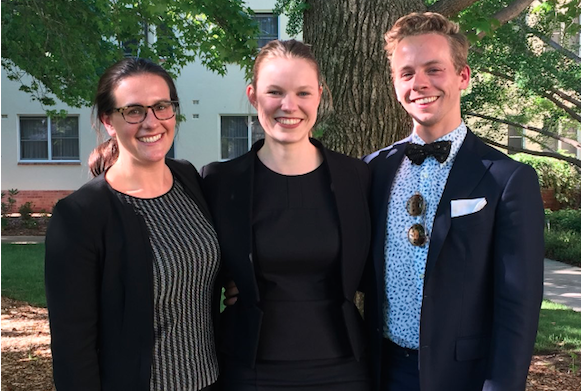 University of Melbourne graduate Brigid O’Farrell-White (L) with fellow Rhodes Australia at Large Scholars Ashleigh Barnes from the University of Technology Sydney (C) and Damien Maher from the University of Queensland. University of Melbourne student Brigid O’Farrell-White has been awarded the 2018 Rhodes Australia at Large Scholarship for postgraduate study at the University of Oxford. Her selection was announced on Tuesday by the Rhodes National Secretary for Australia, Professor Marnie Hughes-Warrington. Ms O’Farrell-White completed a Bachelor of Arts (Hons), majoring in History and Politics/International relations with First Class Honours. She also passed 250 hours of Modern Standard Arabic and Egyptian Colloquial Arabic at Arabeya Arabic Language Centre in Cairo, Egypt. She is an accomplished swimmer, water polo player, surf lifesaver, community volunteer (particularly with disability support groups) and winner of several leadership awards. Melbourne-born Ms O’Farrell, who lived at Ormond College during her studies, said she was thrilled to receive the prestigious scholarship and plans to undertake a Master’s in Oriental Studies and a Master’s in Public Policy. “I want to be part of building a more tolerant, compassionate and just world, and I believe that studying at Oxford will give me the skills and knowledge to realise that vision,” Ms O'Farrell said. “In the longer term, I hope to work in organisations that address global development and security challenges with the aim of building a more peaceful world. Congratulating Ms O’Farrell-White, Honorary Secretary of the Victorian Rhodes Scholarship Selection Committee Carolyn Evans said: “Brigid impressed the panel with her outstanding academic track-record, wonderful extra-curricular activities and clear passion for improving the position of women.